Archaeologist says stone inscription hints at literacy in 10th century B.C. 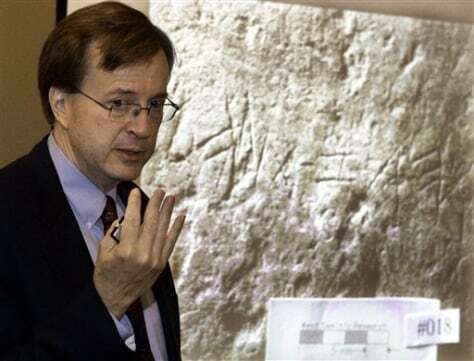 P. Kyle McCarter, an epigrapher and professor of ancient Near Eastern studies at John Hopkins University, talks about the significance of the alphabet found on a rock at the Zeitah Excavations archaeological dig at Tel Zayat, Israel, during a news conference in Pittsburgh on Wednesday. A magnified image of letters from 900-925 B.C. on that rock is projected behind him.